Image via Bo’s Wine Depot’s Facebook page. We wanted to know: What growing pains do business owners face once they have opened their doors? What are their struggles and successes? You can find our previous installments here, here, here, and here. Small businesses and startups don’t necessarily need to reinvent the wheel. Sometimes the best opportunities come from recognizing an untapped market and figuring out how you can serve them in ways no one else can. Bo’s Wine Depot identified just such an opportunity. Now the business continues to grow and is preparing to expand regionally. Buying excellent wine isn’t a straightforward experience—and Boris Wiedenfeld-Needham decided it should be. That isn’t mere romanticism at work. Born near Düsseldorf, Germany, Wiedenfeld-Needham moved to Boston in 1991 after finishing his time in university. He has lived in Eugene, Oregon for over 10 years, and studied Enology (winemaking) through the University of California, Davis. Along the way, he’s also been a professor at the University of Minnesota, hosted an hour-long radio show on food and drink for Eugene-based NPR affiliate KLCC, and he serves on the Board of Directors for Food for Lane County, Oregon’s second-largest food bank. After five years as general manager for Eugene wine shop Sundance Wine Cellars (and its online division, Oregon Wine Merchants), in 2011 Wiedenfeld-Needham moved from the retail side to the distribution side, representing fine wines for California-based Young’s Market Company. In 2015, “the time was right to try and implement this concept,” and Wiedenfeld-Needham left Young’s to launch Bo’s Wine Depot. In order to secure funding and think through how he would be “re-inventing wine retail in Oregon,” in 2015 Wiedenfeld-Needham drafted a business plan on Palo Alto Software’s Business Plan Pro (we’d now recommend you take a look at LivePlan). He decided to launch a pilot store in an established retail area, refining planning and operations with a long-term goal of expanding into a combination of company-owned additional locations as well as franchised stores. The goal, according to his LinkedIn profile, was to create a “regional chain of wine retail stores, unlike anything this country has seen before.” While wine is competitive, Wiedenfeld-Needham has trust in his business plan and the innovation driving his model. In 2016, Bo’s Wine Depot opened in a supermarket-anchored retail space in Eugene, Oregon, with an initial selection of about 200 wines on custom-made wheeled racks (making it easy to clear space for new layouts or public events). On Feb. 16, 2017, Wiedenfeld-Needham celebrated the shop’s first anniversary—and made some big changes that have caused him to both review and update his business plan. With the air of a professor, a deep baritone voice, and certifications such as Certified Specialist of Wine (CSW) and Certified Saké Professional (CSP), Wiedenfeld-Needham strives to balance expertise and approachability. He understands that wine-buying can be an intimidating, no-win prospect for the customer: either grab a bottle of whatever from the supermarket shelf or go into a specialty shop where you feel ignorant and where staff may not be interested in helping you make an informed choice. Wiedenfeld-Needham has set out to prove that you don’t have to be wealthy to access wines beyond the supermarket’s budget aisle. He believes that smaller makers who produce quality wines with utmost care can be accessible to those with modest wine budgets. To that end, Wiedenfeld-Needham focuses on a curated selection at affordable prices, in a welcoming space where any customer can feel assured that they will leave both with a good wine and a solid understanding of their purchase. Wiedenfeld-Needham not only has a vast network of “decades-long contacts,” but something just as essential for implementing his business plan: an understanding of the legal and logistical factors that influence when it’s the best time to buy wines from suppliers. The wine is just the beginning. “You have to innovate, see what no one else is doing, and find an edge,” says Wiedenfeld-Needham. In his vision to reinvent wine retail, he has also launched a Shopify-powered online store for pickup or delivery. The ecommerce platform also integrates with his in-store POS, enabling shared production information and inventory status. In the brick-and-mortar store, bright lighting and colors add to a sense of welcoming and friendliness. The shop feels clean and laid back, yet a few glances at each wine’s custom signage easily relay essential product information to guide a customer’s choice. In addition to knowing as much as possible about his wines, Wiedenfeld-Needham also aims to understand his customers, their preferences, and their shopping patterns. Digital systems for customer care, loyalty rewards, VIP tier pricing, and purchase history lookups give him access to comprehensive data that helps him know what his customers want and what sells when. Weekly emails and regular Facebook posts keep customers informed of new wines, wines that are almost sold out, special deals, classes, tastings, and other special events. Causes, holidays, and current events also give Wiedenfeld-Needham a chance to reach out to customers, sometimes to offer a discount, sometimes to boost signal for an important issue. He’s not afraid to get personal and political. Bo’s Wine Depot gave discounts to women on International Women’s Day, and to scientists engaged in pro-science marches on Apr. 22, 2017. Wiedenfeld-Needham also uses the shop to sponsor events and donate a percentage of sales to Food for Lane County, a local food bank. On Feb. 16, 2017, even though it was the shop’s first anniversary, the German native closed the shop early as part of #DayWithoutImmigrants. It used to be that customers could visit Bo’s Wine Depot, order a glass of wine, and enjoy it at one of the tables along the large picture window at the front of the store. Not anymore. In a February 3rd, 2017 Facebook post, Wiedenfeld-Needham announced that the shop was surrendering its on-premise liquor license—but for a good reason: in addition to selling wine, Wiedenfeld-Needham was adding sales of bottled spirits. That wasn’t in the original business plan though, as the opportunity didn’t exist at the time. Liquor inventory in Oregon is state-owned, and standalone liquor stores operate under tight rules as independent contractors. In 2016, the Oregon Liquor Control Commission (OLCC) launched its “Open Recruitment” program, allowing existing businesses to add liquor sales. After approving 14 operations in Portland, OLCC announced a new application period in Lane County, where Eugene is located. Ultimately, OLCC approved only 10 applications, including Bo’s and two others in the Eugene area. As of Mar. 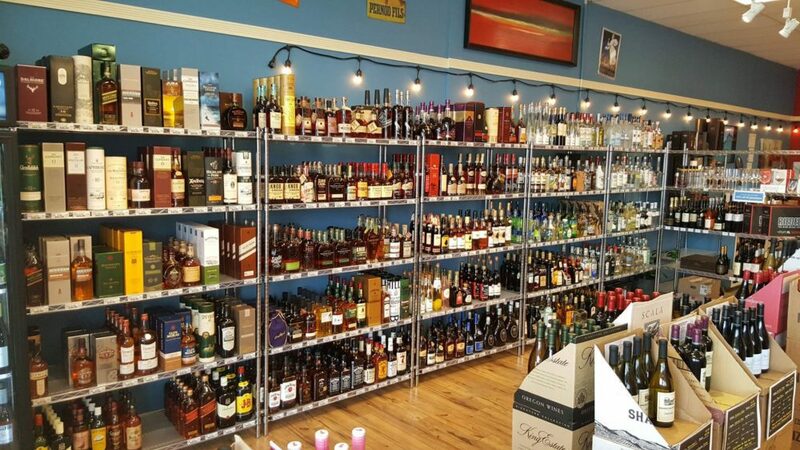 31, 2017, “South Hills Liquor” cohabits the same space as Bo’s Wine Depot—effectively making it a hybrid wine shop and liquor store—but sales of wine and spirits are completely separate, even requiring a second register used solely for liquor sales. Oregon’s liquor stores are also the sole liquor suppliers for restaurants, bars, and other organizations with on-premise liquor licenses—opening up the possibility of commercial sales for the shop. Wiedenfeld-Needham has now increased staff from two (Wiedenfeld-Needham and his wife Karen) to three. Since the state sets liquor prices, liquor stores earn accounts by building relationships. Buzz Kawders now manages liquor sales to licensed businesses, such as bars and restaurants, and he also works in the shop on Sundays. While Wiedenfeld-Needham believes adding spirits is a smart move on a new opportunity, it has also thrown a wrench in his business plan. “This was supposed to be the pilot store for franchise expansion,” he says. “Since the liquor agency is not something that can be re-created, we now have to build a second location to serve as our model store.” Wiedenfeld-Needham had planned to launch a second store in spring or summer 2017, but adding the liquor operation has pushed that back. Now Wiedenfeld-Needham is evaluating a grocery store-anchored retail space on a popular east-west highway that serves both neighborhood customers and tourists in western Oregon. “The area has been getting more upscale, with lots of new developments and nice residential,” says Wiedenfeld-Needham. It’s looking like the perfect spot for his second location. Know your industry. Use trade publications, associations, and events to keep you current on the industry and to help you plan for changes in strategy, inventory, marketing, and operations. Your shop is as strong as your network. Wiedenfeld-Needham is able to source his inventory and unique offerings because of an extensive network of colleagues from vineyards, distributors, and other players in the wine industry. Integrate channels and use data. Integrated systems will help you manage online and in-store inventory and production information. Understanding customer behavior will also help you grow sales and ensure that you are selling the right wines to the right people. Be authoritative yet approachable. Customers want to know they can rely on you for a quality selection and information about a wine. However, they don’t want to feel intimidated or shamed for not being an expert. Tell your wine’s story. Row after row of bottles with no context can overwhelm customers and prevent them making a choice. Aid decision-making through signage that tells the wine’s story and gives the customer some basic information. Adapt. From agriculture to law, wine is a rapidly changing industry. As circumstances change and new opportunities arise, balance staying true to your business plan with being flexible enough to pursue worthwhile opportunities.